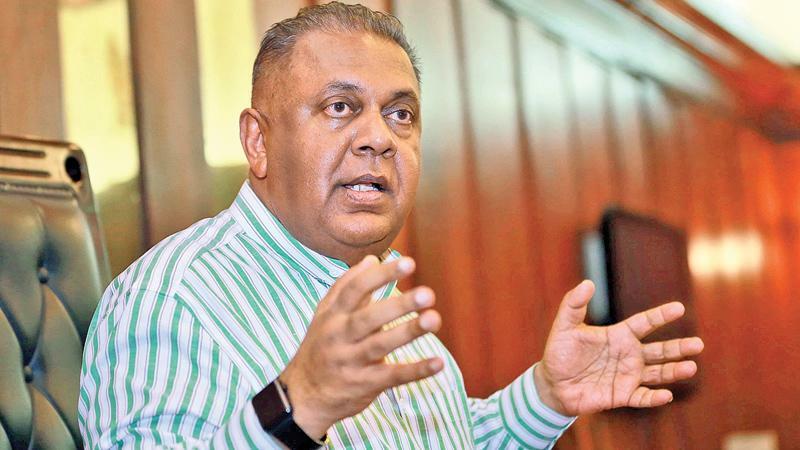 (Lanka e News - 21.Feb.2019, 7.00PM) This is the speech made by Minister of Finance and Media, Mangala Samaraweera in Parliament today (21), during the adjournment debate on the Constitutional Council. If my memory serves me right, I cannot recall an occasion in Sri Lanka’s recent history when the Executive and the Legislature of Sri Lanka drew as much praise and applause as they did, both from our own citizens and the international community, than on the occasion of the passage of the 19th Amendment to the Constitution. It is perhaps the single greatest achievement of this House in recent times, and it stands as President Sirisena’s single greatest achievement since his election to office in January 2015. When, at some point in the future, Sri Lanka pauses to reflect on its history, this piece of legislation will perhaps stand as a milestone, and the beacon that heralded change in Sri Lanka towards good governance and strengthening of democratic institutions that facilitated our nation’s advancement as a strong, vibrant and stable democracy and prosperous and peaceful nation. The 19th Amendment that was signed into law on 15 May 2015 by the then Speaker of the House, Hon. MP Chamal Rajapaksa, after being voted in favour by nearly every single Member of this House, was not the result of a personal agenda of an individual or a group of individuals. This was the realization of the vision and the will of the majority of our people who are pro-democratic and progressive minded. It was the result of a movement to which people of our country including the late Venerable Maduluwawe Sobhitha Thero, politicians, civil society activists, human rights defenders, students, religious leaders, academics, journalists, artists breathed life and gave momentum. There was a time in Sri Lanka where the judiciary operated through “telephone call judgments”. Under this system, all judges were appointed by one man. All ministers were chosen by that same man. In that time, the executive, legislature and judiciary all operated in lockstep in service to that man. If you were with that man, you could never be charged or convicted, whatever your crime. If you went against that man, his sons, his brothers, or some distant cousin, you would be arrested, charges fabricated against you, accused of terrorism, convicted, or worse, thrown into a white van. Under our government, we fortified our nation’s Constitution against the tyrants of tomorrow. We took politics out of the appointment of judges and key government positions and created an apolitical process where representatives of all political parties and eminent persons from civil society would vet judicial candidates. For the first time in decades, judges of every level could travel the country and the world with their head raised high. It became clear to the public that they were nobody’s lapdog, that their appointments and promotions were removed from politics. Today, independent judges give independent verdicts. One former Member of this house has already been sentenced to death for a number of murders. A former DIG has been sentenced to death for running a contract killer squad. The former president’s secretary has been sentenced for misappropriating public funds. During the 56 days in which Mahinda Rajapaksa purported to serve as Prime Minister, we all got to see what their intentions really were. Several police officers and witnesses involved in cases against ‘budding flowers’ received calls suggesting that they put their lives and the lives of their families before their commitment to their jobs. Suspects waltzed in and out of the FCID wearing shorts and t-shirts. A man under investigation for robbing our national airline was reappointed as the head of that airline. Then, all of a sudden, after the 26th October attempt to seize power was ripped apart by an independent judiciary on the Court of Appeal and Supreme Court, they realized that their true enemy was the very existence of an independent judiciary, and the Constitutional Council and its chairman who guard that independence. Suddenly they realized that the judges and Speaker will not bow down to their threats. An independent judiciary, or independent Speaker, is a deadly poison to the Rajapaksa way of governing. Such critical positions must be entrusted with “Sahodharayas” in their world, not patriots like Karu Jayasuriya who will put the country above all else. The President and Prime Minister must be proud of having promoted a Speaker who is the symbol of democracy in this country. This former army officer does not travel around the island climbing on stages, thumping his chest and bellowing about how much he loves this country. Instead he shows us how much he loves it by fighting to defend and strengthen our democracy. This is also why, your Excellency, they are targeting and maligning the Hon. Speaker, Karu Jayasuriya. They learned the hard way that he is fearless, honest, and truly independent. The Constitutional Council is primarily aimed at de-politicizing the state and public service, and within the brief period that it has been in operation, it has proved to be successful in its intended objective. It is no secret, Hon. Speaker that, since the establishment of the Constitutional Council, our country has witnessed a remarkable improvement in the quality of delivery of justice. I am confident that this is a cause for pride for our learned judges themselves when they interact with their peers in other countries. As the Hon. Speaker has clarified, seniority, while being one of the criteria employed by the Constitutional Council in nominating and approving persons for appointment, is not the only criteria. For a country to develop, meritocracy is essential. If, on occasion, the Constitutional Council had not approved a nominee submitted by His Excellency the President, which had resulted in the President having to submit fresh nominations to the Council, this is not a reason to feel slighted. It must be a reason for the President to feel proud that our democracy is becoming stronger. This is what checks and balances are about. This is what democracy is about. This must be a reason for pride to see that what one set in motion is actually yielding the intended results. If an impasse were to arise in the course of business, then the Constitutional Council and the President must work together to find a solution rather than engage in action that would exacerbate a situation. This, to me, is the beauty of democracy and what sets us apart from an autocracy or dictatorship. Since January 2015, we who are the elected representatives of the citizens of this country have managed, despite hindrances and obstacles, to achieve remarkable progress in terms of strengthening systems of checks and balances, thereby curbing unbridled power vested in the executive. Some of the mechanisms that we have set up, such as the Human Rights Commission of Sri Lanka and the Police Commission perform a commendable role in protecting the rights of our citizens and empowering our citizens. This, in turn, strengthens us as a nation. The Human Rights Commission in particular, which has been accorded Grade “A” status by the Global Alliance of National Human Rights Institutions, has become an institution that all of us as Sri Lankans can be proud of. Any reversal of these good governance gains will not only make our citizens suffer in the hands of autocracy, it will isolate us internationally and plunge Sri Lanka into isolation once again. It will have a detrimental impact on Sri Lanka’s potential for economic development and the achievement of prosperity that all our citizens yearn for and deserve.